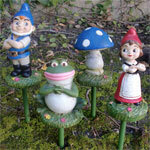 Raise the stakes in your outdoor decor with GardenFun’s gnome garden stakes sets. These adorable and versatile home accessories include classic gnomes, modern designs and movie character figures to fit your unique style and landscaping look. Whether you want to line your pathways or have gnomes sprouting from your backyard greenery, GardenFun has the stake sets for you! Our matching metal gnome and girl gnome stakes are fun and modern. This cheerful couple comes complete with matching outfits and bright colors that will look right at home alongside your flowerbeds. The girl gnome stake comes with a delicate white daisy and her male counterpart has a red and white mushroom. If you are looking for an ultra-durable pair, these all-metal designs are perfect for your yard. They are powder-coated for added rust resistance and are hand painted for a customized look. 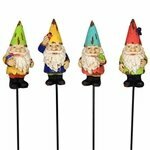 GardenFun’s popular garden stakes include a customer favorite set of four Gnomeo & Juliet characters. Children and adults alike love these whimsical movie figures. They will make your garden come to life. Each Gnomeo & Juliet figure measures 4 or 5 inches in height atop the green stakes. Spread these Gnomeo & Juliet friends throughout your flowerbed for an adorable and unique look. Their metal stakes will slide into the ground easily for quick installation and placement. In addition to these fun and funky gnome stakes, we carry two traditional gnome sets. Our Travelocity and climbing gnomes on vines are available in sets of three, ideal to add to your entry path or backyard. 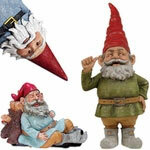 The Travelocity set is a creative and thoughtful gift for your favorite travelers. They are a great reminder to keep traveling and exploring, even in your own backyard. As always, our GardenFun products are coated to withstand the elements to decorate your yard for decades.